Find great gifts for kids, pets, family (and yourself!) with chocolates, teas, paintings, crafts, beauty products, shoes, accessories and clothing -- from upcycled to couture -- at Cincy Chic’s biggest shopping event of the year this Saturday with two floors of pop-up shops, free gift wrapping, swag bag and giveaways! Lace up your shopping shoes and read on for all the shop-till-you-drop details! If you like shopping local, getting freebies, and helping out a good cause in the process, make sure you put Cincy Chic’s annual Seasonably Chic Showcase – happening 10 am to 2 pm this Saturday – on your calendar. The Phoenix downtown will be jam-packed for the event, which will feature 45 pop-up shops of local businesses, a fashion show, brunch ’n’ learn, free gift wrapping and $3,000 in prizes given away to lucky attendees at the event. With more variety and vendors than ever this year — our sixth annual event! — we’re giving you a sneak peek of some of the most unique businesses you’ll find there. Enjoy reading more about them and click here to RSVP for the event! Through jayne kellie you’ll find exclusive pieces to mix into your wardrobe as well as style and lifestyle tips. Also available through jayne kellie are personal styling, shopping and e-styling services. For the Seasonably Chic Showcase, Berry says she’ll be bringing jackets, dresses, blouses and sweaters in some of fall’s best colors. The items available from jayne kellie will make you feel stylish and chic, Berry says. “Whether it’s a family function, date night or holiday party, we have something that will be perfect,” she adds. 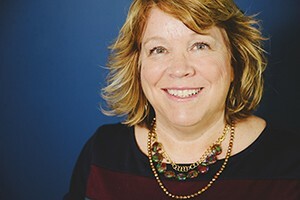 To learn more about jayne kellie, click here. You can also follow along on Twitter, Instagram and Facebook. Purposeful Painting is a non-profit 501(c)(3) that – through group art sessions called “co-creating” – helps the working woman who makes too much money to qualify for assistance but is still struggling to get by. In the two years since Purposeful Painting launched, Knight says they’ve given away a little more than $25,000. Knight says the inspiration for Purposeful Painting was the ability to give back to the women she used to be able to relate to so well. 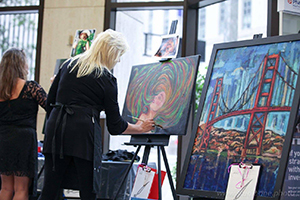 The men and women behind Purposeful Painting raise money for the cause through their paintings, whether they be canvas paintings or events where they bring the paintings. As for the Seasonably Chic Showcase, Knight says they will be bringing ornaments for customers to paint themselves. “We’ll also have other paintings for sale and coupons for Co-Creation Artworks classes,” she adds. If you’re looking for a good holiday gift item while you’re shopping around, Knight says the Co-Creation Artworks classes can be purchased at half price, $25 for individuals or a private group class for $250. To learn more about Purposeful Painting, click here. You can also like them on Facebook. Today, Elberfeld is living her dream and looking fashionable while doing so. She sells Ava Gray Direct from NY, which offers boutique-style fashions and accessories that are offered to women through personal appointments, girlfriend fashion shows with hostess rewards or online shopping. Elberfeld says her goal as a fashion stylist is to help women look and feel great no matter where their day and evening takes them. 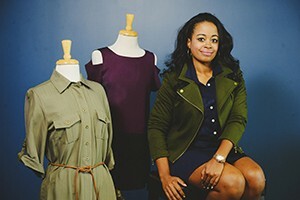 “I show women how to stretch her wardrobe dollars and function by creating different looks with Ava Gray fashions and accessories,” she says. Elberfeld will be at the event with accessories for cash and carry and some of the top selling clothing items from the fall/winter Ava Gray Direct fashion lines including the Draped Ponte Gray Jacket trimmed in black. She’ll also have clothing and accessories on all the live models, which will be showcased in the freeze modeling fashion show for the duration of the event. 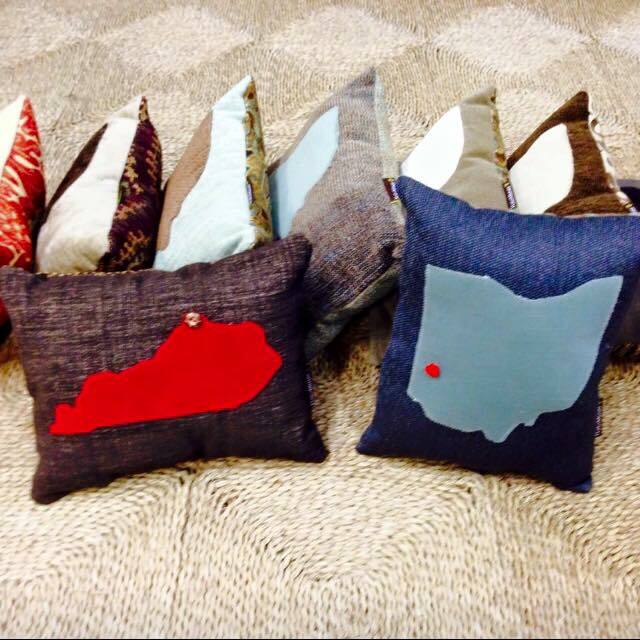 There are plenty of items from Ava Gray Direct that make great holiday gift items. Elberfeld says the top gift item is a soft faux fur wrap that can be worn in multiple ways for $44. 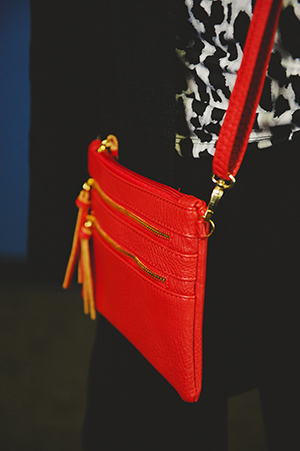 Wristlets can be used alone or with a crossbody strap ($40-$44). Scarves ($26) can be purchased in plaid, polka dot, solids and zigzag patterns. The Hook Your Look jewelry by Zac and Ally and available through Ava Gray can be hooked to chains to create a necklace. To learn more about Ava Gray Direct from NY, click here. You can also find Elberfeld on Facebook. HaloMiner’s light weight knit tunic and tassel necklace. Reblando says the mission of HaloMiner is to create a collection that’s one-of-a-kind while using unique materials. As for the event this Saturday, HaloMiner will be there with a selection of gift items such as seasonal pillows, small accessories and their original purse and cape designs. Reblando says the pillows made by the team at HaloMiner are a great addition for any decor and the clothing is a perfect one-size-fits-all gift for the discerning fashion and eco-conscious woman. Fellerhoff says that HaloMiner also offers classes, workshops and parties throughout the year. “We love to share our passion and creativity and believe collaboration enhances results, which is why we also welcome custom projects,” she says. To find out more about where you can buy HaloMiner products in local stores, click here. To learn more about HaloMiner, visit www.halominer.com. You can also like them on Facebook or follow along on Instagram and Twitter. Specializing in fab finds and designer duds with some previous experience, Clothes Mentor and Once Upon A Child will have great pop-up shops at the event. 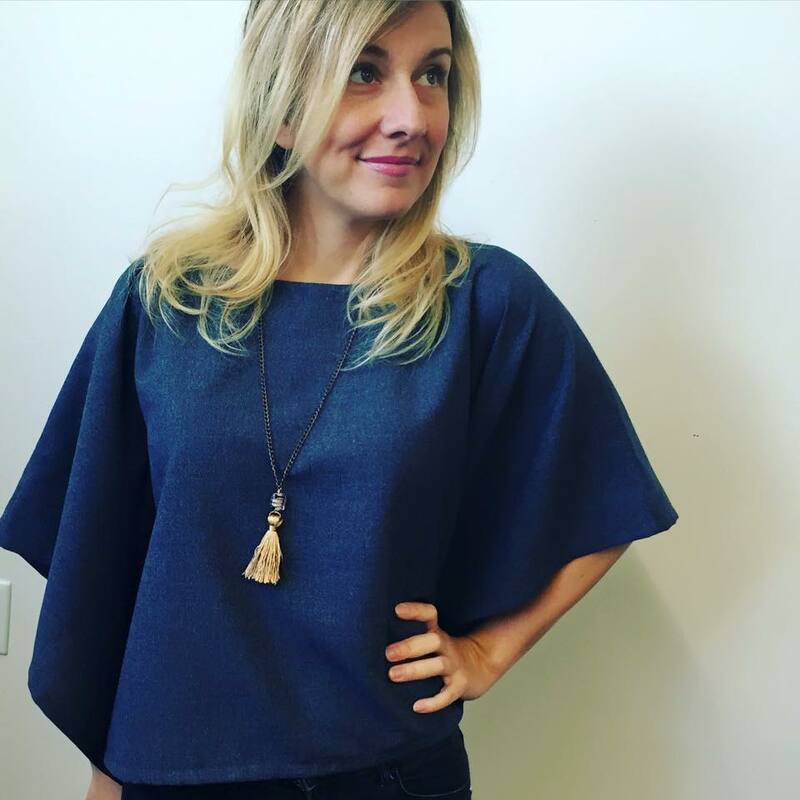 Clothes Mentor is a women’s resale store that buys and sells gently used, current style apparel and accessories for women sizes 0-26 as well as maternity. Once Upon A Child is a children’s resale store that buys and sells gently used kids clothes, shoes, toys, gear and furniture. “Unlike consignment shops, we pay cash on the spot for the items you and/or your children are no longer wearing,” says Cincinnati-based Kate Paynter, who owns the local franchises for both Clothes Mentor and Once Upon A Child. At the Seasonably Chic Showcase, Paynter says they will be featuring women’s infinity scarves, leggings, jewelry and children’s tutus and hair bows. Prices for the items from these resale shops are affordable, with scarves running from $5.99 to $9.99, leggings at $6.99 and jewelry from $5 to $10. Products from these shops are trendy, Paynter says, so you won’t be missing out on the latest styles while getting great deals. You can find Clothes Mentor stores in Hyde Park, West Chester, Fields Ertel and Anderson. There are Once Upon A Child locations in Hyde Park, West Chester, Fields Ertel, Anderson, Colerain and Western Hills. To learn more about Clothes Mentor, click here. You can learn more about Once Upon A Child by clicking here. Don’t forget to click here to RSVP for Saturday’s Seasonably Chic Showcase. The event is from 10am-2pm at the Phoenix downtown. Parking is available next door for $2. The event and venue is child/stroller-friendly. All attendees will receive free entry, swag bag, and gift wrapping with the donation of one canned good for the FreeStore FoodBank. Click here to see the full list of local businesses and vendors that will be featured at the event! Watch a highlight reel of last year’s event below!